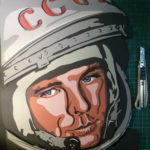 Yuri Alekseevich Gagarin amazing portrait Картины и портреты из цветного картона на заказ. 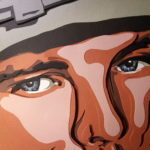 A revised portrait of Yuri Gagarin, which was presented at the annual exhibition STREET VISION In Tomsk. 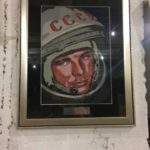 Yuri Alekseevich Gagarin – a world celebrity. April 12, 1961 for the first time in world history, made a flight into outer space. 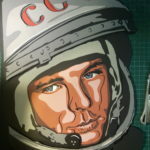 After numerous surveys, training sessions and control tests, Gagarin, along with his backup, German Titov, was selected for the first space flight. 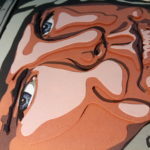 On April 12, 1962, the day of Gagarin’s flight into space was declared a holiday – Cosmonautics Day.